This show preview is brought to you by Feld Entertainment. Calling all Superheros! Marvel Universe LIVE! is coming to Atlanta late-December with stops at both Phillips Arena and the Arena at Gwinnett Center. If you’re looking for that final “WOW” gift or need a brief break from candy canes and Santa, it’s time to round up your favorite caped hero for this unique experience. The show will include all of your favorite Marvel Super Heroes including Spider-Man and The Avengers (Iron Man, Black Widow, Hulk and more) and threatening villains all duking it out in an energy-packed show. Check out the video below which gives a small look at the cutting-edge special effects, pyrotechnics, aerial stunts, martial arts, motorcycles and more that you’ll see at this arena experience. Tickets are on sale now. For the Arena at Gwinnett Center, purchase here, and for Philips Arena, purchase here. Want to see more? 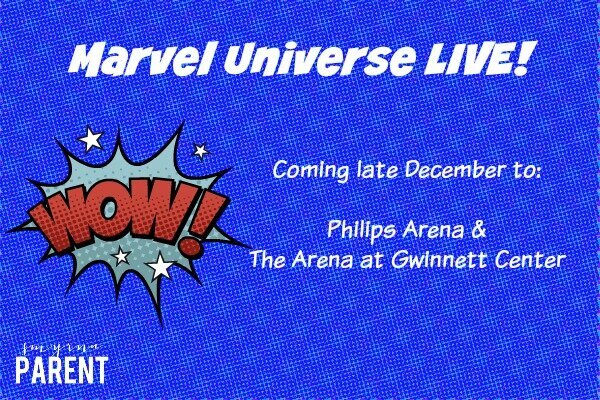 Check out this preview and follow Marvel Universe LIVE! on Facebook.